Fingerprints Music wants to curate a responsive website for music lovers, vinyl record enthusiasts, and anyone who enjoys supporting their beloved artists. The website must resonate with their current branding. There are currently two separate websites which includes a homepage site for their main store and ecommerce store for digital downloads. They are looking to merge the two sites into one. A responsive website designed with new and old elements such as logo, typography, content, and iconography. Existing design assets were combined with new design material to create a fresh new experience. 1. Research prevalent music & retail industrial trends that may affect Fingerprints. 2. Find out the dynamics & relationship between the customer and Fingerprints business. 3. Find out if streaming music affects purchasing merchandise at Fingerprints. 4. Understand the core essentials customers look for when shopping for music. 5. Understand consumer behavior when shopping in stores versus online for music. I focused on these five goals throughout the research phase. Secondary research explored topics in the music, retail, and ecommerce industries. What does the future of music look like? Due to technology, the music industry will undergo a paradigm shift over the next 10 years. How will we listen to music in the future? The sharing economy and digitalization are so deeply implemented in daily life that the streaming services, music, movies or any other, will continue being in demand. How will industry adopt new technologies like virtual reality? Combination the technology with digitalization and cloud services. The music in the future will respond to the bodies, moods. For instance, using the wearable technologies, devices will recognize the state of mind and play the track complementing the moment. Why do customers shop in stores instead of online? I visited the physical record store in Downtown Long Beach to find participants and conduct 1:1 user interviews. There were a total of six participants. Three were actual customers and the other three were employees. The data collected from user contextual inquiries was translated into an empathy map. This involved organizing research findings into Think / Feel / Say / Do / Pains and Gains categories, which helped break down common themes (shown below) into user insights and needs. To Stream or not to Stream. That is the Question. Participants were aware of the differences between streaming versus listening via a physical object and live performance. Choosing to stream music is a personal choice. Those who stream music do it for convenience. Participants shop for records because of sound quality, listening experience, and album artwork. Participants want 100% transparency with product descriptions, shipping, returns, policies, & customer responsibility when shopping online. Participants look at convenience when shopping in stores and online. Participants like to shop at stores that have a curated selection of genres based on their personal preferences. Participants purchase online only if they couldn't find that specific item in person. They all knew exactly what they wanted when shopping. 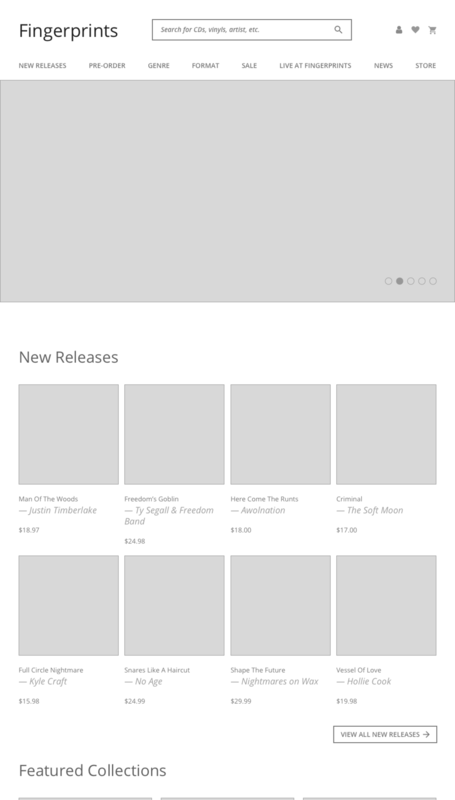 Desktop wireframe mockups for home, category, product, and shopping cart pages. 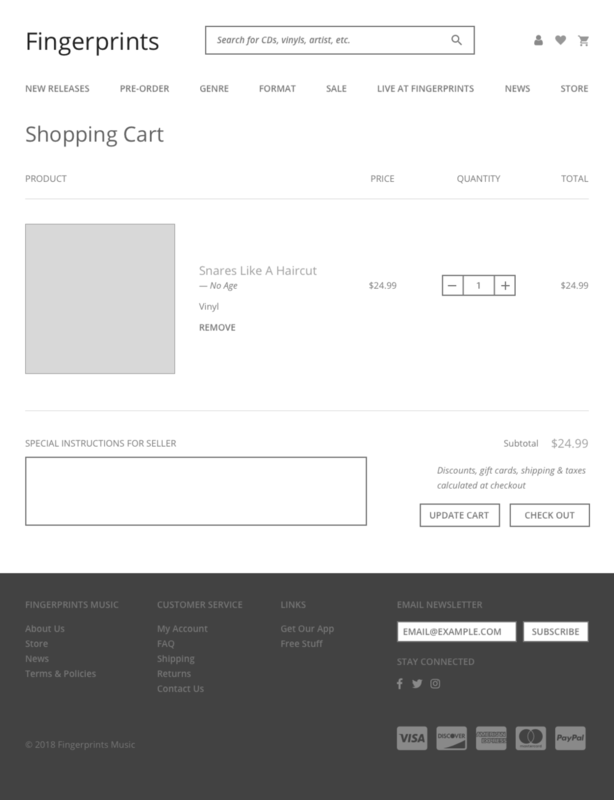 Desktop wireframe mockups for Fingerprint's checkout process pages including customer information, shipping method, payment method, and confirmation pages. I wanted to stay as close as possible to Fingerprints branding and decided to keep their logo. Their ecommerce website was already using Ubuntu typeface as a body type and Merriweather was chosen to compliment it as a display type. Black, white, and grey neutrals were chosen for the color palette, mirroring with their current two websites. Performing usability tests were the last pieces of the puzzle needed for research and design integration to build the final product for Fingerprints Music. The results were high-fidelity responsive mockups for both desktop and mobile. I learned a lot about both professionalism and design deadlines in the process, especially when working with my own client. Based on the experience working on this project (and as an avid music listener myself), I learned how the music industry is heading down the road of individualized personalization. Something to take mentally note of for the years to come. I spoke to the owner during the early stages of this project. Currently, I am still in communication with Fingerprints Music.